Fairmont Olympic Hotel. Photo by Joan Magnano-Damm. Seattle is a city of gourmet coffee, micro-brew beer, sensational spirits and award-winning Washington wines. We have some pretty terrific liquids here, and Seattle’s four- and five-star hotels serve them up to visitors and locals alike. Of course, a fringe benefit to hotel beverage tasting is that we’re also granted entry to some of the city’s most glorious hotel restroom facilities. And, on those occasions when I’ve over-hydrated, I can think of no better place to go! For instance, in the Pan Pacific Hotel in the South Lake Union neighborhood on the second level there’s a restroom that is reminiscent of being in the South Pacific. 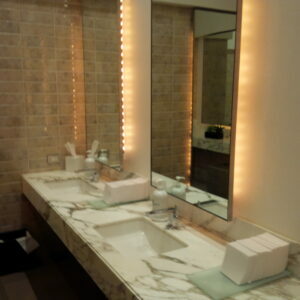 Tiki-like light torches, beaded mirrors above the sinks and bamboo paneled stalls are most exotic. The Four Seasons Seattle Hotel. Photo by Joan Magnano-Damm. After a local ale or glass of wine at the brand new Goldfinch Tavern inside The Four Seasons Hotel, I peal across the hotel lobby area to the ladies room where they display sumptuous marbled counter tops coupled with large brick sized tiled walls and large squares of marble flooring. 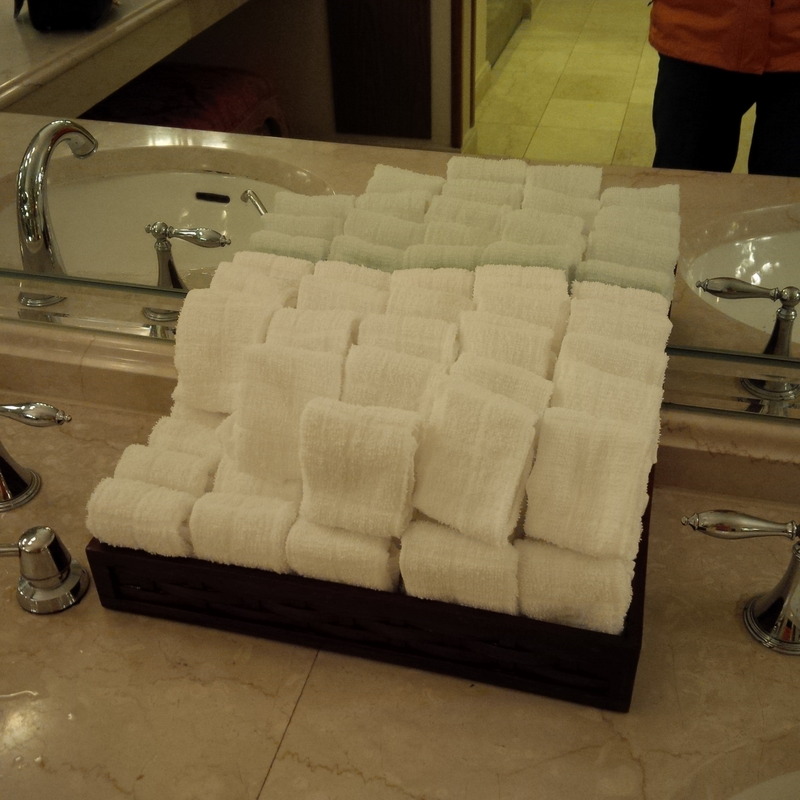 And the neatly folded hand towels are always abundant. Hotel 1000. Photo by Joan Magnano-Damm. 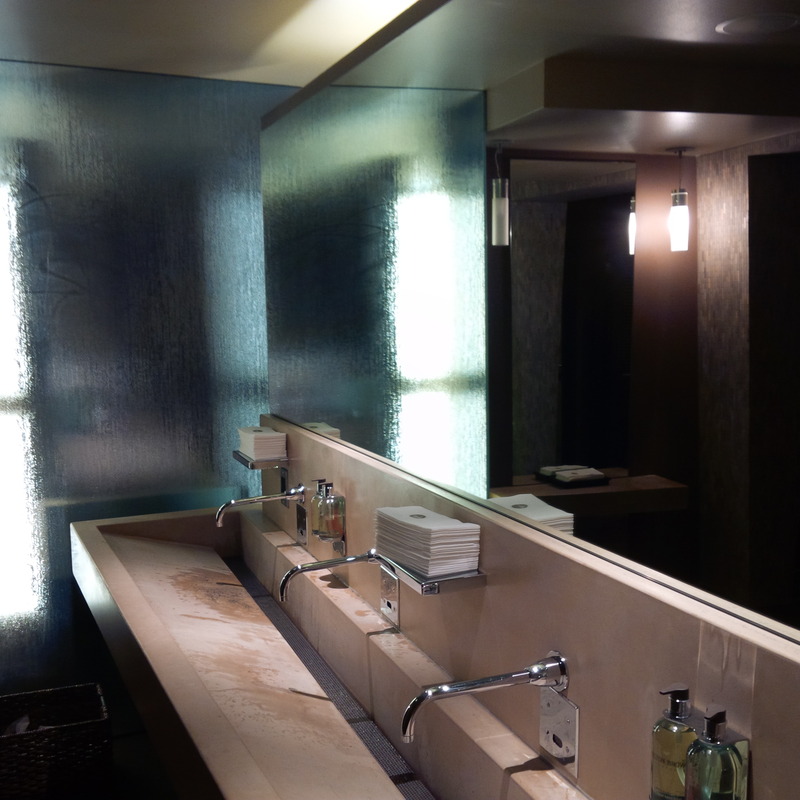 The Hotel 1000 restrooms feature spacious trough-like sinks and the variety of bottled hand lotions hung on the sparkling tiled walls are there for the dousing. Heading up to the high end shopping district to the Fairmont Olympic Hotel finds an abundant number of options. My restroom of choice there is located on the Mezzanine level above the Georgian Room. A rather long hallway and then two steps down, there’s a floor length mirror and abundance of additional mirrors over the sinks and vanities that makes me feel like royalty. 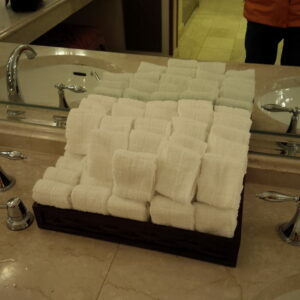 Small white terry cloth hand towels indented with tiny squares are piled generously in brown rattan boxes on the counters. If you don’t have the time, you can always remain on the lobby level off the Garden Court for another gorgeous and comfortable restroom respite with additional burgundy upholstered banquettes for the lounging. So, remember to hydrate without a worry. Mind you, though, I can’t speak for the men’s restrooms. Joan Magnano-Damm is a National Account Director with Visit Seattle. She knows everything is better with butter and syrup. In order to get ready for her next breakfast, she loves to run, walk and swim around the area.